This book provides readers with an overview of traditional and contemporary architectural representation methods and offers insight into significant developments in computing as they apply to architectural drawing and modeling. It offers readers a look into recent developments in technologies that have impacted architectural design and representation workflows, and focuses on digital design software used in higher education and industry, including Robert McNeel & Associates Rhinoceros® (Rhino 6 for Windows), Grasshopper®, and Adobe Illustrator® CC. The book covers fundamental methods for digital drawing, 3D modeling, and visual programming through descriptions, examples, and tutorial-based instructions specific to the production of digital design drawings and graphics. Drawing from the Model: Fundamentals of Digital Drawing, 3D Modeling, and Visual Programming in Architectural Design presents beginning architectural design students and professionals with a broad overview of drawing and modeling in architectural representation, by addressing historical analog methods based on descriptive geometry and projection and transitioning to contemporary digital methods based on computational processes and emerging technologies. 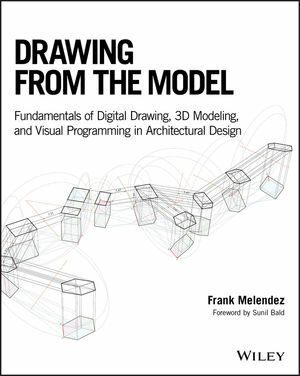 The book focuses on digital tools, techniques, and workflows for the production of design drawings; plans, sections, elevations, axonometrics, and perspectives, utilizing contemporary, cutting-edge 2D drawing and 3D modeling, design software. Additionally, visual programming is introduced to address topics of parametric modeling, algorithmic design, computational simulations, physical computing, and robotics, as methods for exploring architectural design and experimental drawing processes. Sections cover Architectural Representation and Digital Technologies; The 3D Modeling Environment and Geometry; Architectural Design Drawings and Graphics; and Computational Design. It features an appendix filled with 10 design drawing and 3D modeling exercises intended as educational and pedagogical examples for readers to practice and/or teach workflows that are addressed in the book. Drawing from the Model will serve as an excellent resource for beginning architectural design students in higher education and as a helpful reference for professionals in practice, teaching readers beginning and intermediate digital representation methods for the production of architectural design drawings that reflect contemporary aesthetics and graphics. These drawings are generated using 3D modeling and parametric/algorithmic workflows to create linework that is enhanced with digital drawing and graphic design software. Additional workflows include the use of 3D modeling and visual programming environments to explore fundamental concepts of computational simulations, physical computing, and robotics and introductory methods for addressing these topics. FRANK P. MELENDEZ teaches at The Bernard and Anne Spitzer School of Architecture, City College of New York. His teaching and research engage topics pertaining to architectural drawing and 3D modeling, digital fabrication, computational design, emerging materials, responsive systems, physical computing, and robotics. He has held academic appointments at Carnegie Mellon University and Louisiana State University, and has been supported through grants and fellowships, including the MacDowell Colony. Frank is a partner at Augmented Architectures, a research and design practice in New York, NY, and has professional experience working at prominent offices, including Gehry Partners, LLP and Urban A&O. He holds a Bachelor of Architecture degree from the University of Arizona and a Master of Architecture degree from Yale University.